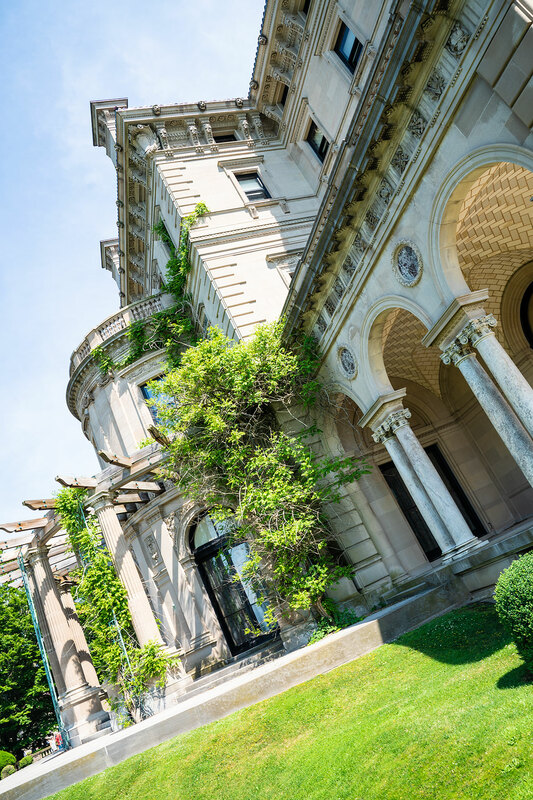 If you explore one historic mansion during your visit to Newport, Rhode Island, make it The Breakers. This incredible mansion, built by Cornelius Vanderbilt II (heir to the Vanderbilt fortune), is often called the epitome of the Gilded Age. Chris and I have explored castles throughout Europe, and still, The Breakers stands out as one of my favorite preserved buildings. It’s just so extraordinarily beautiful and so unbelievably well-preserved. 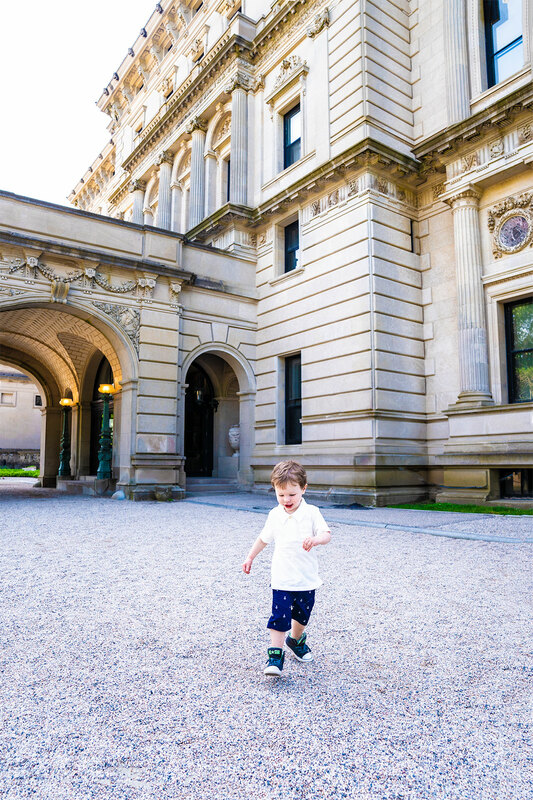 Chris and I decided to attempt a tour of The Breakers, even with a toddler in tow. We decided to arrive early in the morning, before the crowds became too heavy, and kept our fingers crossed that Trevor would behave for a quick (self-guided) tour of the mansion. You’ll begin your tour by entering the ornate north gates of the mansion. 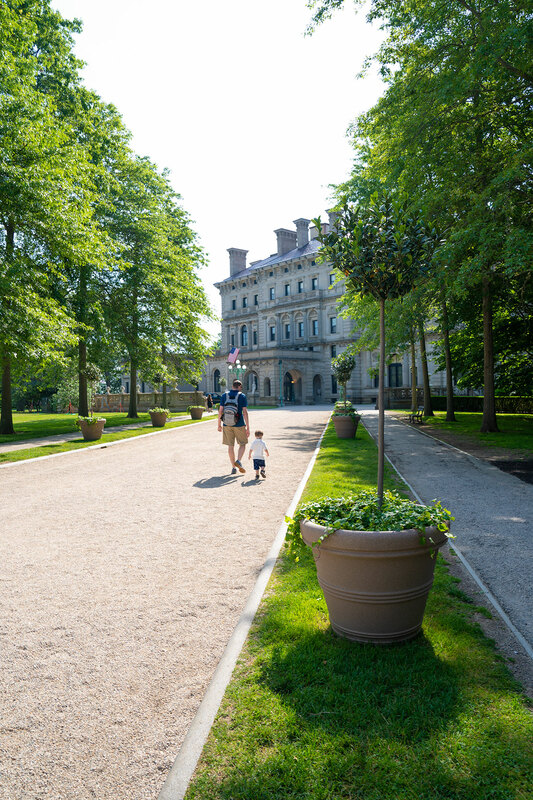 The Breakers is now open daily to the public and owned by The Preservation Society of Newport County. Walk the gravel pathway leading up to the mansion and begin by taking in the front entrance. The limestone exterior is beautiful, with intricate detail and molding. It was incredible for me to learn that this 70-room mansion was “just a summer home” for the Vanderbilts! The Breakers was built in the late 1800’s and took only two years to complete! The first room you’ll enter after you purchase your tickets is the Great Hall. This room was designed to make a jaw-dropping first impression, and it definitely succeeds in making a grand impact! 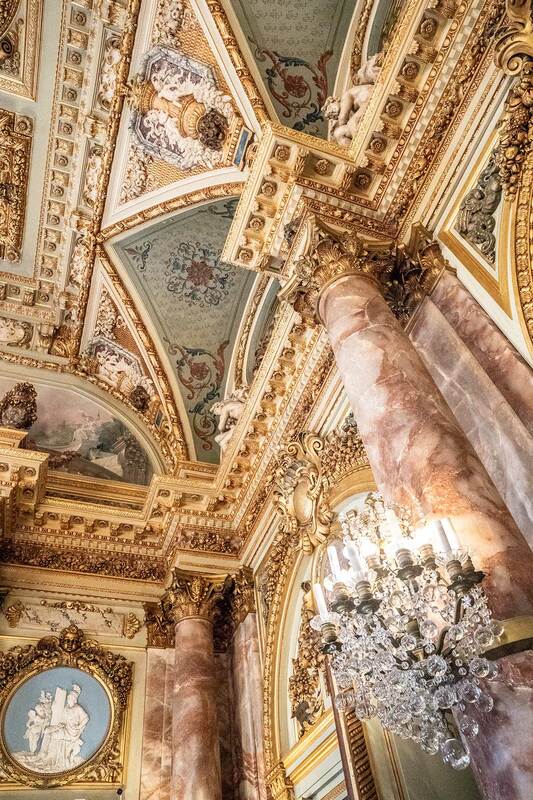 The Great Hall – all gilded wood and marble with painted ceilings – is fifty feet tall! But beyond the colossal scale, the intricate detail that adorns every square each is incredible! 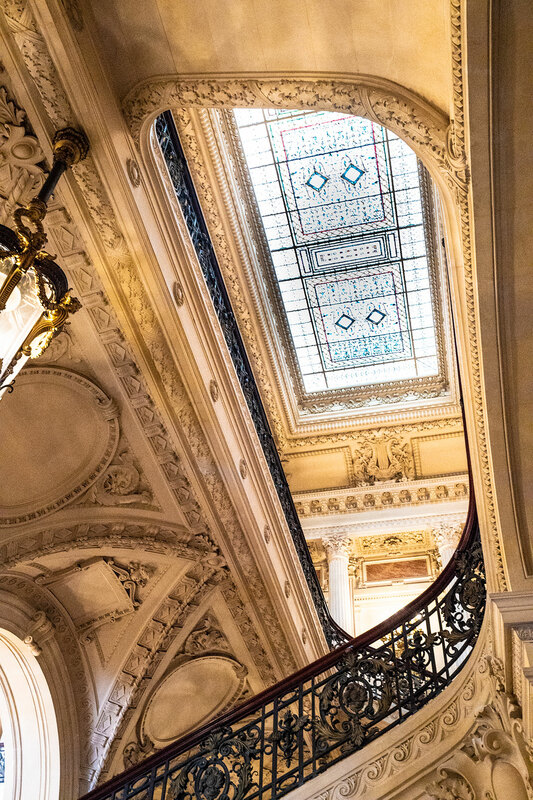 The burgundy-carpeted grand staircase leads to some of the mansion’s 70 rooms. And above the Grand Staircase: a stunning stained glass skylight. And the arched doorways, adorned with burgundy drapery, offer stunning views of the blue ocean that seems to stretch for miles beyond the green lawn. Next, let’s step into one of the most ornate and luxurious rooms I’ve ever seen in the United States: The Breakers Dining Room. 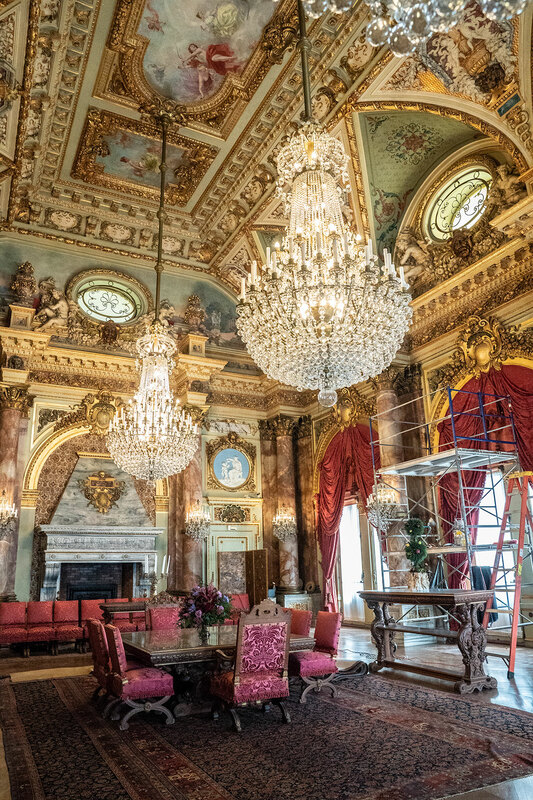 One of the things I love most about The Breakers is how every room is not only beautifully preserved but also fully decorated with incredible chandeliers, original furniture and lavish draperies. Another incredible room is the Music Room, which has an open and airy feel with lots of natural sunlight streaming in through the floor-to-ceiling windows. 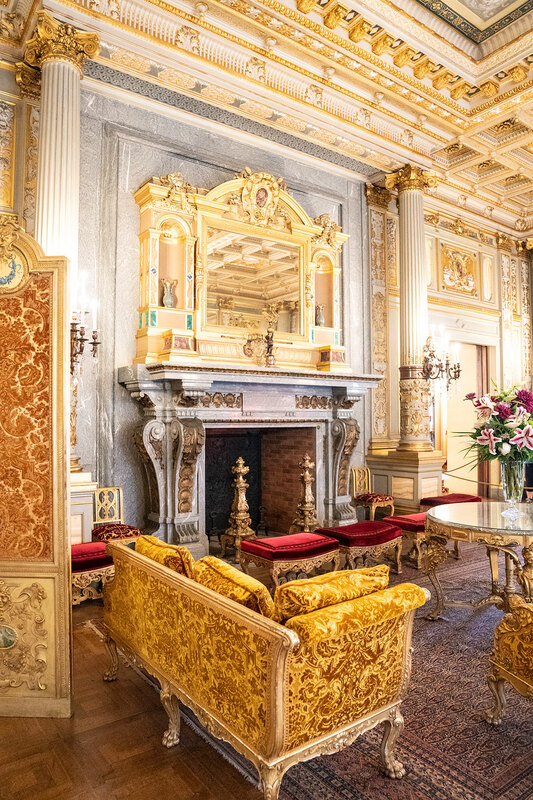 The Music Room is lavishly decorated in gold and burgundy with gilded wood and stunning chandeliers. The Library is also really striking. 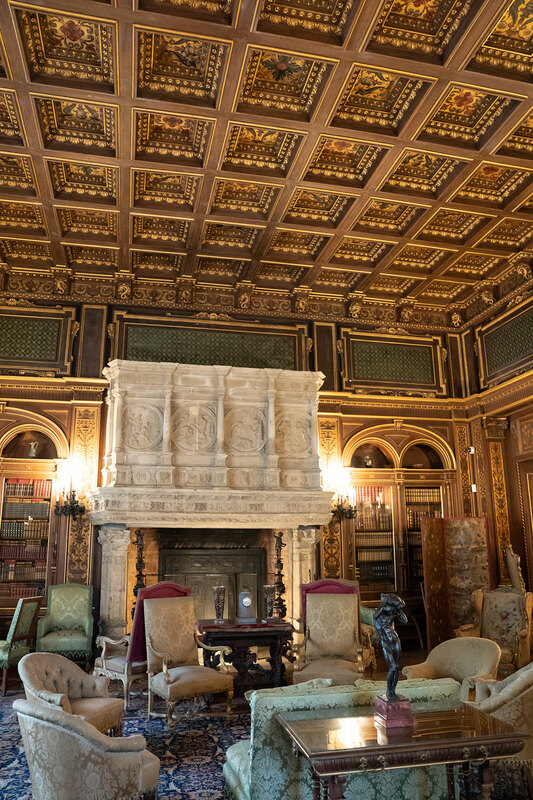 The ceiling includes intricate dark wood paneling and the beautiful fireplace is originally from a French château. This room is so perfectly preserved, even every book is in perfect order! I know bathrooms are the rooms that are mostly likely to show their age and look outdated. But I was in love with this one particular bathroom at The Breakers. More than one hundred years after it was built, who wouldn’t want this bathroom in their own home? I’m using it to inspire my own bathroom decor! In building The Breakers, the Vanderbilts took every precaution against potential fire. And they did not want any odors from the kitchen wafting into other rooms in the house. So the kitchen was completely isolated in a ground-floor wing. Even so, it’s still stunning, with a huge assortment of copper pots. Even this hidden-away room seems so much more grand than anything in my own home! Aside from the jaw-dropping beauty of the mansion, the view at The Breakers is the other star of the show! The sweeping open air balcony on the second floor, with painted ceilings and sweeping arches, offers stunning ocean views. The blue sea seems to stretch on and on forever beyond the manicured lawn. After touring inside the mansion, we walked around outside to explore the grounds and the exterior of the mansion. 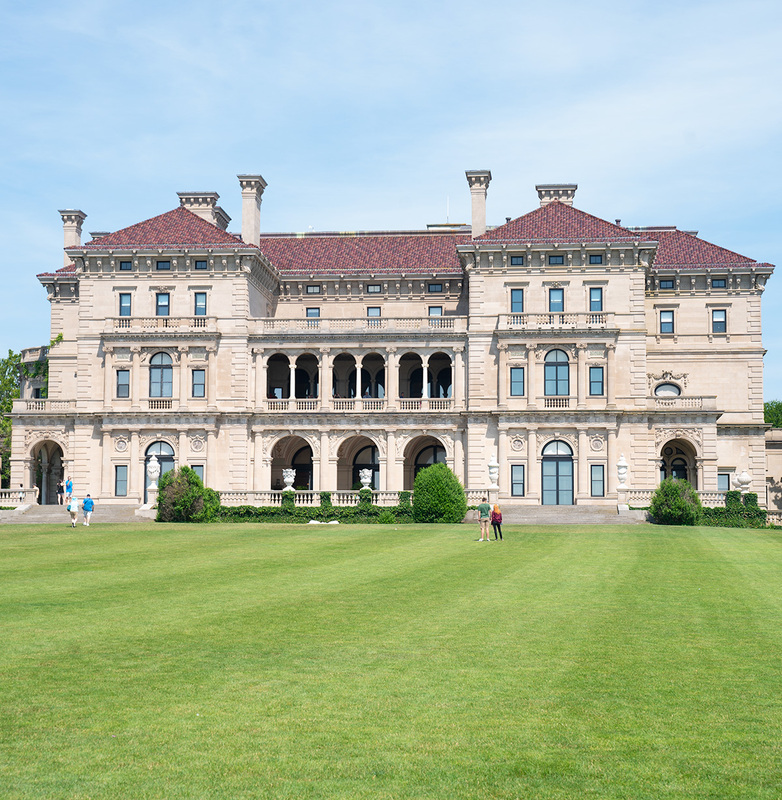 The east facade of The Breakers faces toward sweeping, panoramic views of the wide-open ocean. To me, it’s even more beautiful than the front entrance. Trevor loved running free on the wide open green lawn. And I loved snapping photos of the intricate detail of the exterior and the beautifully landscaped grounds. The lead architect of the mansion, Richard Morris Hunt, did not live to see The Breakers completed. And the owner of this “summer home,” Cornelius Vanderbilt, suffered a stroke only one year after it was completed. So he had only one good year to entertain and enjoy the realization of his dream. But I like to think that the outcome, over 100 years later, is better than they probably ever imagined. The Breakers lives on, perfectly preserved, for millions and millions of visitors to admire and explore. Each visitor probably imagining, like I did, what it might be like to live daily life surrounded by all of this stunning beauty! What Are The Crowds Like At The Breakers? The Breakers can get extremely crowded during the summer months, especially on weekends! It can be challenging to find parking and make your way through the mansion during peak times. To avoid heavy crowds in the summer months, try to arrive immediately at 9am on weekends. Even better, if you’re visiting for more than just a weekend, arrive at opening on a weekday. What Does Admission To The Breakers Cost? We were surprised to learn that there are actually several options for admission tickets. This is because The Preservation Society of Newport County actually runs 10 different historic properties, all open to the public. If you’re interested in checking out several of the historic mansions in Newport, you can save a lot of money by buying a Five House Ticket. Kids under the age of 6 are free. You can check out ticket options and purchase tickets online here. Are There Tours At The Breakers? We can’t do guided tours with Trevor since he’s too young to stand quietly with a group for the entire length of a tour. 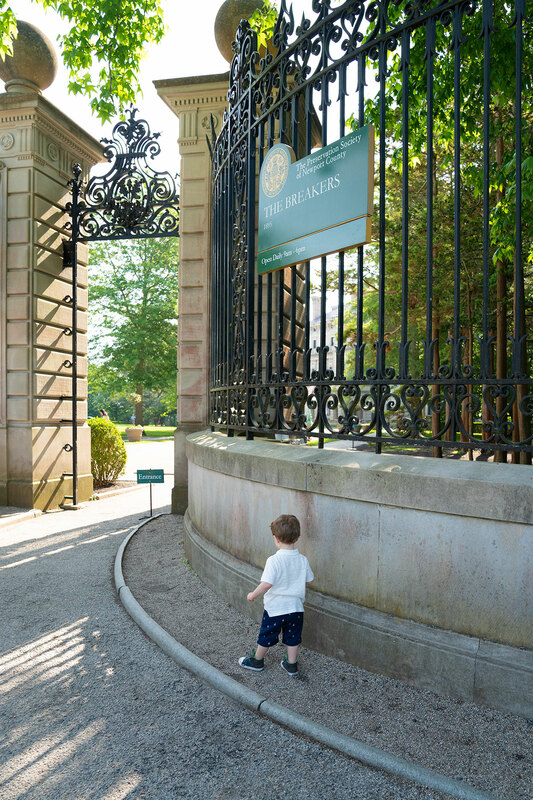 So we were thrilled to learn that admission to The Breakers is self-guided, meaning you can walk through in your own time and at your own pace. Headsets providing audio tours were available and included with the cost of admission. There are also additional options for tours, for example, a “Beneath the Breakers” underground tunnel tour, if you’re interested in exploring The Breakers more in-depth. How Long Does It Take To Tour The Breakers? Although Trevor managed to sprint through The Breakers in about 20 minutes, most will prefer about one hour to tour The Breakers! This allows time to enjoy each of the rooms. If you’d like to spend time wandering the grounds down to the ocean, or if you’d like to browse the gift shop, plan for about 1 1/2 hours. Is The Breakers For Kids? Older kids may be fascinated by the jaw-dropping size and opulence of The Breakers. But younger kids may not find a lot of interest here. Our toddler, Trevor, looked around a bit, but mostly sprinted from one room to the next. There is a lot of green space outside the mansion, so adults can take turns bringing young children outside. For example, Chris took Trevor outside to play while I photographed the rooms inside.